We noticed, there were so many comments available from our readers about the p0sixspwn jailbreak errors iOS 6.1.3, 6.1.4, 6.1.5 & 6.1.6. Most of the users have failed to jailbreak & get Cydia for their devices using p0sixspwn untethered. So, we decided to publish an article as a support for all users those who got trouble with jailbreaking p0sixspwn to get success because; there are no any complete troubleshooting guide in the web for p0sixspwn. 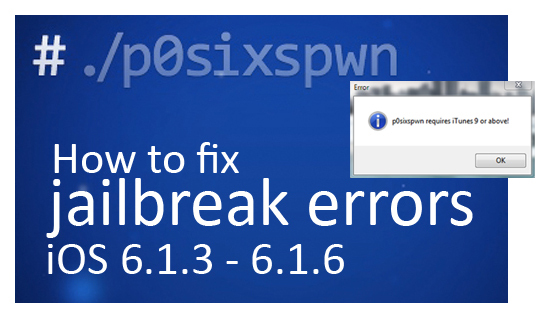 The most of the jailbreak errors which comes with p0sixspwn are Windows base. Normally p0sixspwn jailbreak Windows version doesn’t work for everyone at every time. Therefore, you have to find Mac computer to jailbreak your device with p0sixspwn if following all didn’t work for you. However, no of p0sixspwn errors can fix as bellow. How to prepare for p0sixpwn jailbreak ? Windows users must need to extract the p0sixspwn jailbreak program directly to C: drive. As well as run the the program as an administrator (Right click on the program & select “Run as administrator”). How to downgrade iTunes ? Hold down the power & home button together until device turn off & again turn the device on (stay connect the device to the computer). Then it will continue the progress from there. If it is not worked, reboot both your device & computer & try again jailbreak process from the beginning. May fix by program runs in Windows XP compatibility mode. Also some users have managed successfully jailbreak by updating iTunes after the “performing magic..” error. Most of the cases, users inform they cannot find Cydia on their home screen. Then they try to jailbreak again for Cydia & program says device is already jailbroken. So, fully restore your device using iTunes & jailbreak again with p0sixspwn. Other-vice, you can jailbreak & tethered boot with redsn0w, then open Cydia search and install p0sixspwn untethered package. Windows 8 users can use p0sixspwn to jailbreak iOS 6.1.3-6.1.6 ? Yes you can. If get some issues ? Try to run p0sixspwn program in Windows 7 compatibility mode. Most of the time p0sixspwn well work with Mac platform. But, p0sixspwn may get crash after rebooting the device on Mac. Then, Mac users can try p0sixspwn 1.0.2 for jailbreak. Actually jailbreak with p0sixspwn may produce issues more than the other untethered tools. But most of them are solvable. So, we hope this help & work for you. Comment us your experience, it will help others as you. 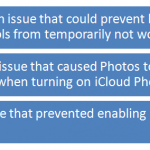 How to fix iOS 9 – iOS 9.0.2 Pangu jailbreak errors? i run iox 10.8.5 on this macbook, i have itunes 12.1.0.50 on the comp, on the iphone i have 6.1.4. can anyone help? I uninstalled ITunes 12 and then couldn’t get my computer to install ANY older version of ITunes. The installer would go all the way to the end, then rollback the changes and tell me errors were encountered. What’s up with this? What else can I try? All those suggestions failed?? So, p0sixspwn jailbreak Windows version doesn’t work for everyone at every time. Therefore, you may have to find Mac computer for complete task.. I jailbroke my Ipod 4g with this. it said it succeeded but no cydia on home page and my ipod keeps restarting after 5 minutes! please help my backup is corrupt also! I did reboot. I turn my Ipod on and I can do everything with a bit of lag for about 5 minutes before see a white screen flash then go black followed by the apple logo. p0sixspwn says my Idevice is jailbroken but cydia is not on the homescreen. I cannot use a backup as that is corrupt. Ifunbox says I have a program called cydia app install but I can’t find it on my ipod. Also thank you for the fast reply. THANKS!!!!! It worked. I did reset my Ipod but only after copying all files with IfunBox. once again THANKS!!!! Does this program work with Windows 10..? Did you run as administrator mode ? I run Windows 10 on my microsoft surface pro 3.
n i got stuck in “performing music”. i’ve already tried to run the program in compatibility mode (windows 7, windows 8 n windows XP), but i still got stuck in the same process. i followed all the instructions of deleting the itunes 12.?.? version, then downloaded the 11.1.5.5 version. my iPod 4G’s latest available update is ios 6.1.6, but most of the apps need ios 7 to run properly, so that’s why i want to jailbreak my ipod. i reli like using my ipod 4G, n not planning to buy the latest ipod as it’s a bit expensive. plz reply asap, thz a lot. i need help on the program it says plug in device please help!!! What is the error message ? 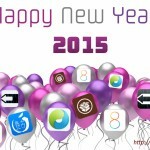 What is your iOS version ? Mine always show “Jailbreak Failed error:No Internet?” After hitting the Jailbreak button. I did what the instruction said and it always ended up to that message. I have my Internet Connection on. Any Suggestions? Need an answer immediately. Thank You. Pls right click and run as admin mode. OH MY GOD! Who ever created this support page, is amazing! I have been trying to get my iPod jailbrkoen for weeks, with no luck at all. I had tried many many different versions of iTunes, with no luck. And this entire time, all I had to do was download iTunes 11.1.5. p0sixspwn never quit during the performing magic stage… THANK YOY SO MUCH! At first the jailbreak progress begins, the device reboots & then = “p0sixspwn quit unexpectedly” = the app crashes. I tried this on a Mac running 10.7 & another running 10.10. Same problem. It worked for me. Running Windows 8 in Windows 7 compatibility mode as administrator. Uninstalled latest version of iTunes and all iTunes components, deleted the iTunes folder under My Music, restarted, and installed iTunes 11.1.55. NOTE: Make sure you check your device manager for an “!” on a iPhone/Pod driver (just right click on “!” and update and search, Windows will install the driver). Also check iTunes preferences -> device, check mark the box “prevent iPod from automatically syncing”. Its stuck on plug in your device. It doesnt recognise the device no matter whatever I do. I installed itunes, ran the applicatiion in admin mode but nothing seems to work.